Our beloved city has no shortage of culture, especially when it comes to parading! The St. Joseph’s Society celebrates St. Joseph with a parade through the CBD and French Quarter. The festivities kick off at 6 p.m. at the intersection of Convention Center Blvd. and Girod Street. It includes 16 floats, nine marching bands and a whole lot of guys dressed in tuxedos. For more information and adorable photos of their famiglie Italiane, visit them on facebook and their website. Join Jim Monaghan’s posse at their 36th Annual St. Patrick’s Day Pub Crawl and Parade on Friday, March 16, 2018. The festivities begin at 8:00 a.m. with breakfast and registration for the day’s activities. After a day of visiting their favorite neighborhood bars, they’ll load up onto mule-drawn carriages that evening to parade through the streets of the French Quarter. Beginning and ending at Molly’s at the Market (1107 Decatur. St.), the route will lead marchers down Decatur Street to take a right on Bienville Street, then take a right on Dauphine Street to loop past Erin Rose (811 Conti St.). They’ll march down Bourbon then finally take a right on Gov. Nicholls St. to return to Molly’s. 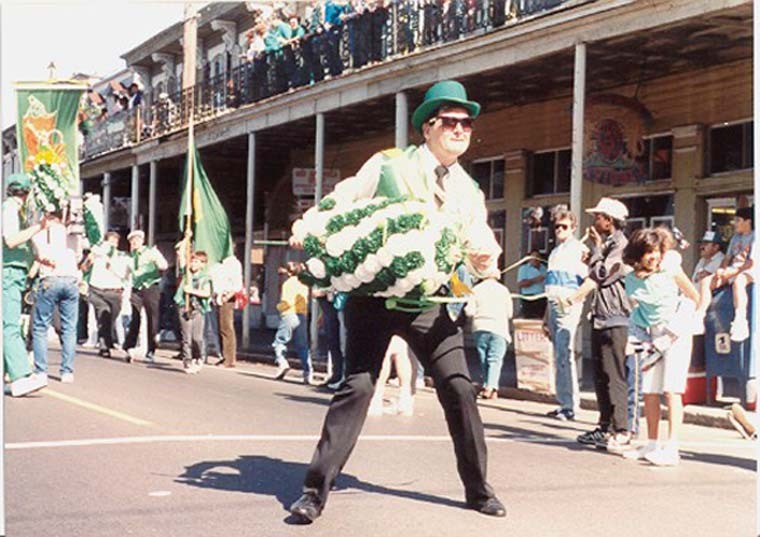 Since 1979, the Downtown Irish contingency has paraded annually on St. Patrick’s Day proper. They’ll continue this tradition on Saturday with a march from the Bywater to the heart of the French Quarter. This year’s stroll begins on the corner of Burgundy and Piety in the Bywater, proceeds roughly up Royal, across Esplanade to Decatur, up Canal to Bourbon. Of course, they’ll be making several “pit stops” on the way to Bourbon St. The Beauregard-Keyes House will open their annual St. Joseph’s Altar to friends, family, and neighbors again this year! The Altar will be open to visitors Sunday, March 18 and on St. Joseph’s Day, Monday, March 19. For those who would like to make an offering to the Altar, contributions will be enthusiastically welcomed during BKH business hours (10-4) on Friday and Saturday, March 16th and 17th. Interested in learning more about the tradition of St. Joseph’s Altars? Click here! And check out this listing of many of the St. Joseph’s Altars across the city.